A few weeks back, I landed on the website of Tony Percy. Can't quite recall the internet crumb trail that lead to his door (I think it might have had to do with Bernard O'Connor's book). Either way, Tony's site has proved to be thought-provoking. He recently wrote a series of blog posts about the Radio Security Service (RSS) during the Second World War and even touched upon the fate of Engelbertus Fukken (Jan Willem ter Braak). 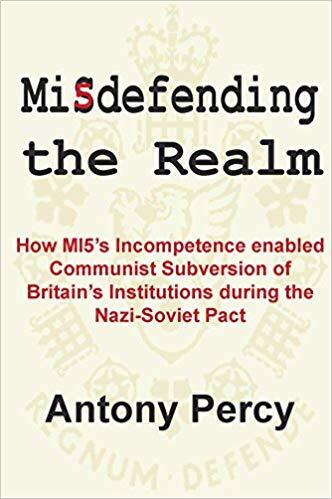 While I don't necessarily support all of Tony's conclusions, I must say that his research is meticulous and his blog posts are thoughtful and thorough. It's definitely worth a look. 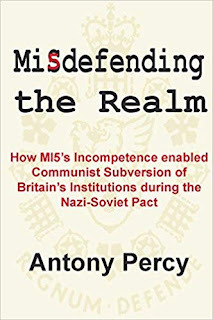 Tony recently published a book - Misdefending the Realm: How MI5's Incompetence enable Communist Subversion of Britain's Institutions during the Nazi-Soviet Pact. I think the title says it all and while I haven't yet managed to get a copy onto my desk, it's definitely on my to-read list.